Gorgeous ice skating dress in shades of turquoise! 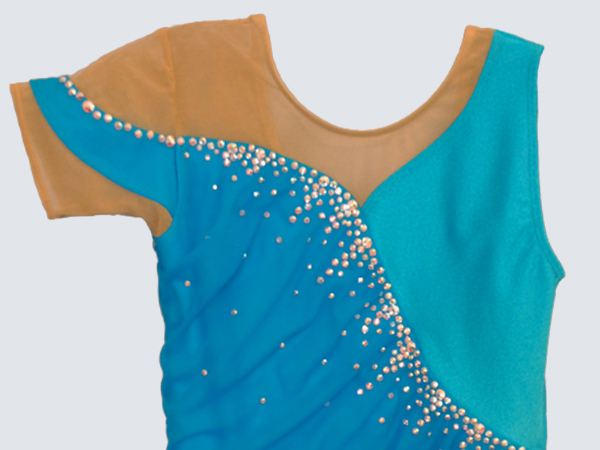 Asymmetrical styling gives this ice skating dress that extra something special - one shoulder strap appears to be off-the-shoulder, and the bodice is rouched in turquoise mesh on one side. 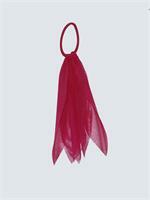 The suntan mesh back opens up dramatically, and seems to be held together by a crystal 'strap'. The handkerchief style skirt is two-layers of mesh with a darker turquoise on the top and a lighter turquoise on the bottom. Tone on tone color adds a subtle beauty to this ice skating dress. 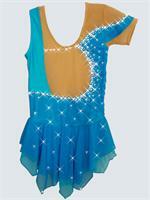 AB color crystals adorn the bodice in a lovely diagonal pattern. 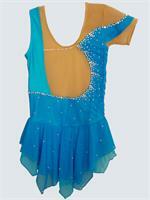 AB color crystals are also scattered over the bodice and skirt. Ice skating dress has over 450 crystals. Only one dress available as shown in size 12. 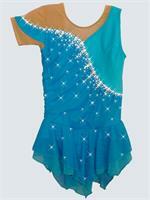 Ice Collection dresses usually ship next business day. Please know your Revella Skatewear size. Please contact us with any questions. Revella Skatewear ice skating dresses give you quality at affordable prices.